iRack Series, a Self Cooled, Self Powered & Self Contained Rack Trend towards having Intelligent Infra Capsules on Premises at Banking & Insurance Sector, Warehouses, Manufacturing sector & Educational Institutions made the Rack manufactures to think on the concept of iRack. Thanks to Technology, which made the concept a reality today The Racks manufactured out of steel sheet punched, formed, welded and powder coated with highest quality standards under stringent ISO 9001-2008 Manufacturing & Quality management system to ensure the highest quality product. 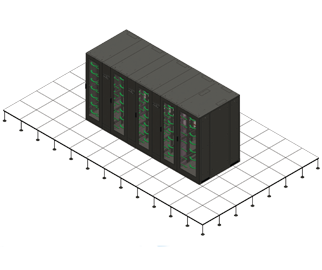 A standard for Racks configuration will be welded ultra-rigid frame with 4 No. Pillars of 14 Gauge steel sheet 6 folded profile welded to the top and bottom ribbed /reinforced frame additionally supported depth-wise by welding 6 No. depth rail 4 folded 75mm 16 Gauge profile. Front Glass door with lock & key and Back Metal door with lock & key and Plain dual side panels. Freestanding on a plinth. To Complete intelligence in iRack NetRack integrate 3Kw PAC Unit, UPS & Battery bank, Intelligent PDU for Power, Surveillance & environmental management, KVM & Console for server management, Intelligent Rack access for physical security will complete full fledged iRack Configuration.. iRack equipped with Air-seal Kit, Blanking panels, Brush models and panels for complete Airflow management.